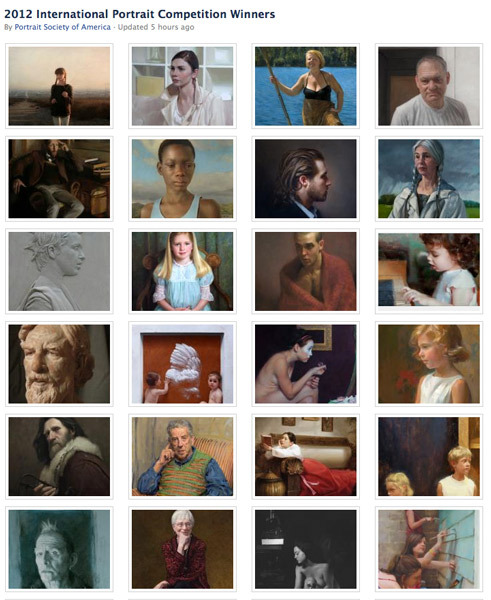 The Portrait Society of America has posted the images of the 2012 International Portrait Competition Winners into an album on its Facebook Page. In total there are some 50 photographs of the winners of the top prizes and all other awards. 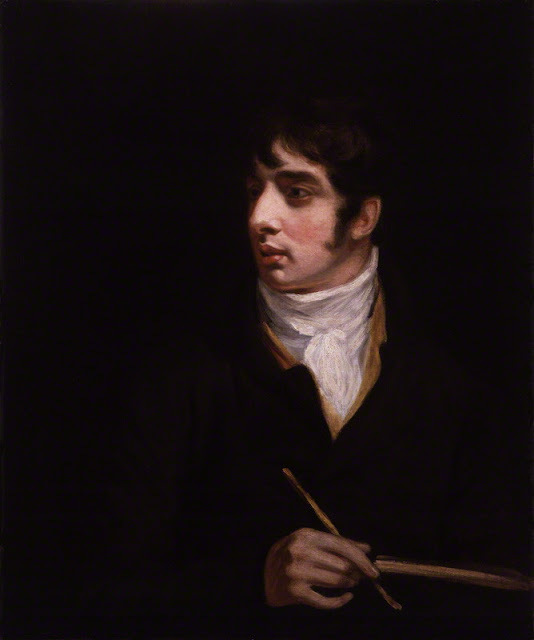 They photographs indicate that the standard of portraiture is extremely high - and refreshingly free of the academic and commissioned photographs of illustrious people (by and large!). The portfolio of images reminds me much more of the BP Portrait Award rather than the Annual Exhibition of the Royal Society of Portrait Painters. Those who enter either or both only need to review the images on Facebook to see why I arrive at this conclusion. The Exhibition was held May 24 – 27, 2012 in Philadelphia, PA so I'm not too sure why it has taken until today to post all the images to facebook. The reason for this post is that the PSA website has only a small proportion of the images on the website page relating to the 2012 exhibition. So this new Facebook album is the only place you can see all the artwork which won an award if you were unable to visit the exhibition. I very often post links the websites of awardwinning British Artists. It occurred to me maybe I should also do the reverse and show British Artists what the websites of those who win prizes at the annual exhibition of a prestigious art society look like. Note folks that they all have websites and many also have blogs and/or Facebook pages! First Place Award for "Year at Sea"
I must confess I'm very puzzled by how American Art Societies describe their prizes! Posted by Making A Mark on Friday, August 31, 2012 0 comments Who's linking to this post? 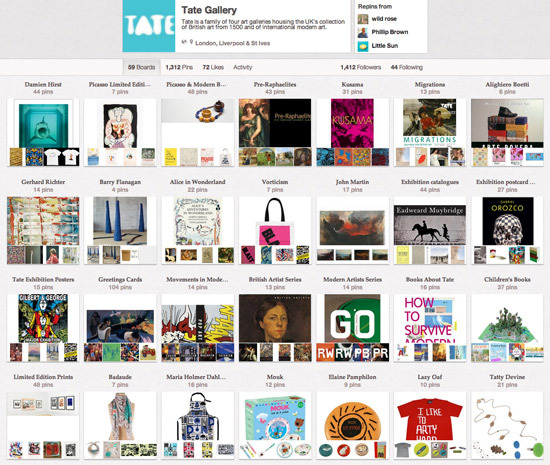 Last week I discovered that the Tate has a Pinterest account (see http://pinterest.com/tategallery/ ). I looked a bit further and realised that it was actually just a way of the Tate Gallery shops bringing their products that they're retailing to people's attention. So you click on Damien Hirst or Gerhard Richter and think you might get to see more of their recent exhibitions. You do - but only to the extent that the Tate is selling a poster of the work or the exhibition poster or a catalogue. The account has identified, organised and set up a number of Boards which all feature items for sale in the Tate Gallery shops. This is strictly retail folks! In a very curious way, it tells you what people think about art, artists and what art museums are for. Could it be that museums have now morphed into shops? I found it all rather depressing. Is this really the way that the Tate wants to be identified on Pinterest? Compare for example the Smithsonian's approach - with their Archives of American Art account. Posted by Making A Mark on Thursday, August 30, 2012 4 comments Who's linking to this post? 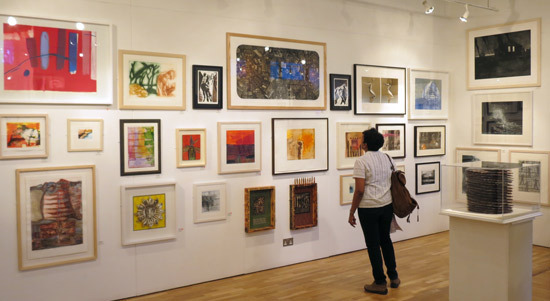 I'm extremely impressed by the quality of work in the brand new Printmaking Open Exhibition of the The Royal Society of Painter-Printmakers (RE) - the RE Open which continues at the Bankside Gallery in London until Sunday 2nd September. I've found that printmaking - as practiced by the RE - is an art form which both stays in touch with its past and at the same time embraces innovation with open arms. I remember seeing digital prints being exhibited in an RE exhbition a few years ago - when it was very clearly demonstrated that digital art was able to create an entirely new form of printmaking which also demonstrated excellence. It would appear that those submitting work to this competition are even more contemporary than maybe the RE! Posted by Making A Mark on Wednesday, August 29, 2012 12 comments Who's linking to this post? Have you ever fancied having a dedicated studio or gallery space - on wheels? 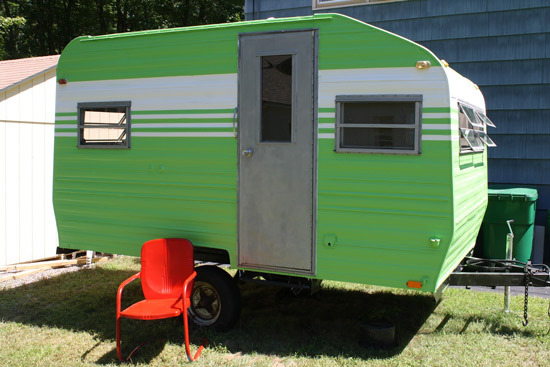 My friend Nicole Caulfield decided her summer project was to create a mobile studio/gallery for art fairs and the like. I am committed to have my camper gallery up and running before Columbus Day weekend for our Fall Foliage Art Studio Tour. A lot has happened in the last two weeks! Posted by Making A Mark on Tuesday, August 28, 2012 10 comments Who's linking to this post? 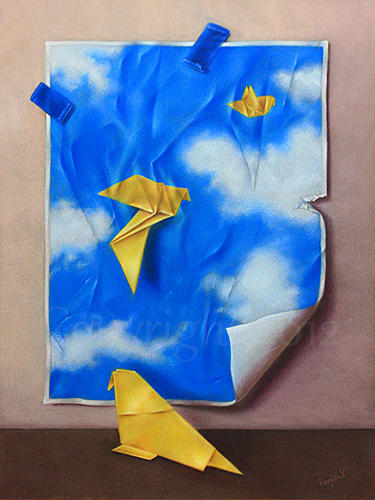 The artists whose work has been selected for the UKCPS 11th Open International Exhibition 2012 are as follows. 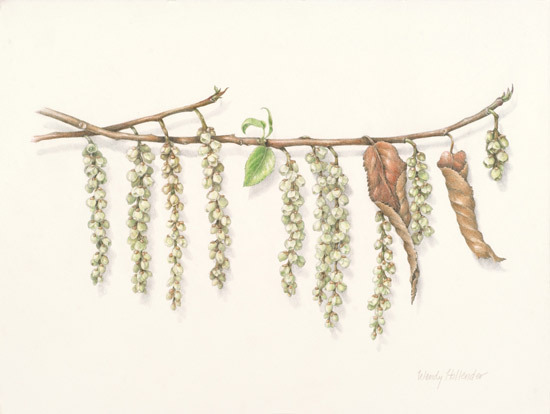 I'd like to thank American colored pencil artist Ranjini Venkatachari (blog) for her images of her work. Ranjini is based in Washington State. She is a signature member of CPSA(colored pencil society of America) and a juried member of Women Painters of Washington. She is currently the Vice-president of Seattle District chapter of CPSA. Posted by Making A Mark on Monday, August 27, 2012 1 comments Who's linking to this post? There are two exhibitions for lovers of feline art in London at the moment. Links to the exhibitions in both gallery websites include the images of a number of the paintings, drawings and fine art prints on display. 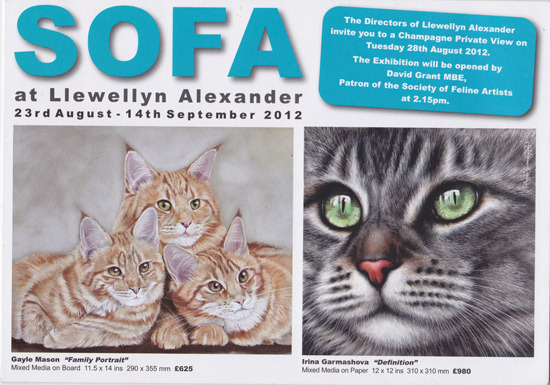 The first is the Society of Feline Artists - Annual Exhibition 2012 at the Llewellyn Alexander Gallery, 124 -126 The Cut, Waterloo, London SE1 8LN UK ( across the Road from the Old Vic and Waterloo Station). This is the annual exhibition which shows work by full and associate members of SOFA. It opened on Thirsday, has its PV on Tuesday and continues until 14th September. You can also see a lot of photos of the exhibition on Flickr - See the album on flickr and See them as a slide show. My friend Gayle Mason (Fur in the Paint) has got two in the window - of which one is also on the front cover of the PV invite (below). Gayle and I normally go to see the show together - but she's busy looking at wildlife in Yellowstone National park and Canada at the moment. If you want to see the best you need to go early as people who buy paintings are allowed to take them away and they are then replaced with other paintings. The second exhibition is Louis Wain and the Summer Cat Show at the Chris Beetles Gallery 8 & 10 Ryder Street, St James's, London SW1Y 6QB (facing the rear of Christies). This opened on the 18th August and continues until 9th September. Both exhibitions are excellent shows for lovers of feline art - and two exhibitions makes a wonderful reason for a trip to London for those who are 'out of towners'! Posted by Making A Mark on Saturday, August 25, 2012 0 comments Who's linking to this post? 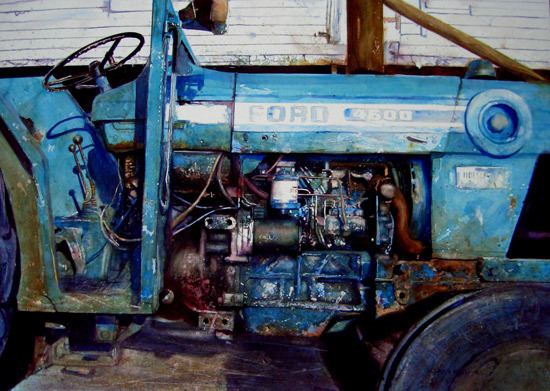 The Hesketh Hubbard Art Society is based in the Mall Galleries and this week it's been exhibiting its annual show. four models available: three ‘life’ providing 15 minute poses, 30 minute poses or a ‘long’ 2 hour pose and one clothed portrait. 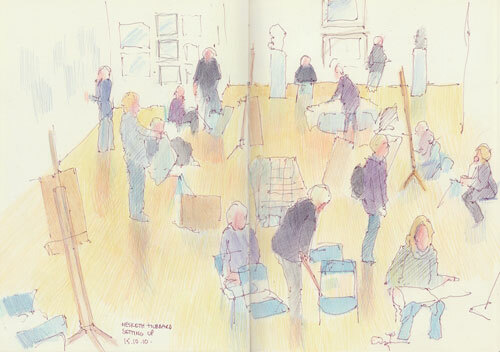 annual fee: £215 a year, for which there are 48 drawing sessions and no cover charge. The thing which deters me from joining this society is the fee which is steep if you don't go every week. An alternative option are the various places which provide drop-in life drawing sessions for free (eg Princes Drawing School - first Thursday of the month) or sessions which can be booked and paid for on a more ad hoc basis (eg at museums and art galleries) or on at least a termly basis (art schools). The Annual Exhibition can be found in the North Gallery. This is not a Society which has juried entry for either the Society or its annual exhibition. Artwork on display is by participating members and from what I can see this is not an open exhibition and hence there is no work by non-members. Due to this way of operating, I found it unsurprising that the works on display reminded me very much of an ordinary art society. The calibre of work on show is very definitely NOT the same calibre as artwork seen in exhibitions by the other FBA art societies based at the Mall Galleries. However what did surprise me a lot was that very little of the artwork in the exhibition appeared to be life drawings or paintings done in one of the untutored live sessions of the Society. Whenever I've seen an exhibition by a Life Drawing Club before it's always been of work done in one of the sessions. I may of course have got this entirely wrong as I've never attended one of the sessions and hence have not seen the quality of the work produced. However I have regularly attended life drawing classes over the years and am very familiar with the type and calibre of the work produced in such sessions. I would have really enjoyed seeing more 'live' life drawings - it was certainly one of the reasons I visited - and I wish there were more. What would have been good is if all exhibits were clearly marked as to whether they were live session work or studio work. Posted by Making A Mark on Friday, August 24, 2012 0 comments Who's linking to this post? 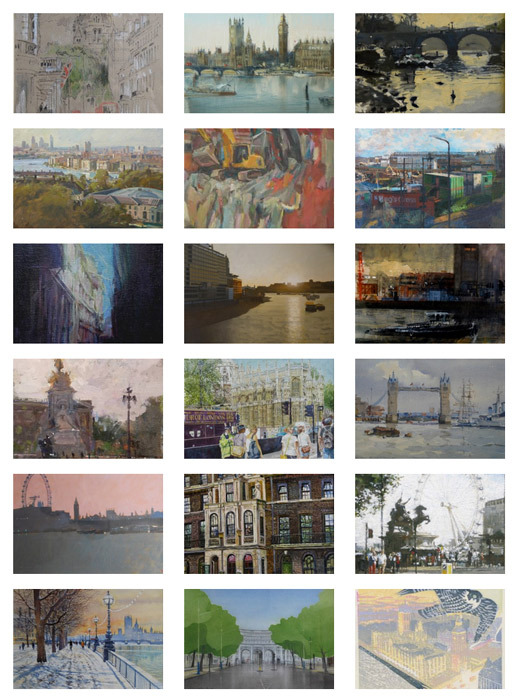 FBA Presents London - The latest 'group' exhibition by members of the various national art societies that make up the Federation of British Artists finishes on Saturday. I'm hoping to get to see it tomorrow. To celebrate London 2012 the historic Federation of British Artists showcase their views of London at the Mall Galleries. Taking us on a tour through the city, the exhibition documents London’s landmarks, as well as its lesser known corners, through the eyes of its artists. What's new with this exhibition is that all the images are for sale online - via the microsite as well as via the exhibition in the Mall Galleries. The Exhibition is open until 25 August 2012 and closes at 3pm on Saturday. Posted by Making A Mark on Thursday, August 23, 2012 0 comments Who's linking to this post? Below you will find more details of the exhibitions and how you can see them. © 2008 Brooklyn Botanic Garden, All Rights Reserved. Posted by Making A Mark on Wednesday, August 22, 2012 0 comments Who's linking to this post? The £30,000 is the most valuable prize for a single work of figurative art in the UK. 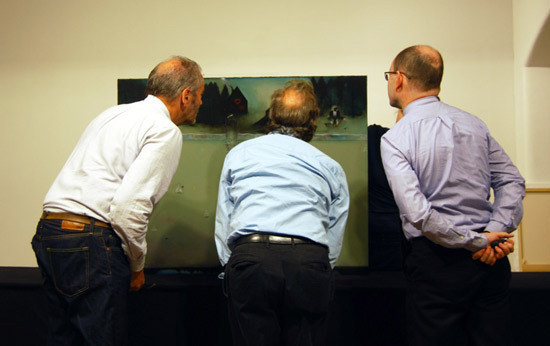 The total of 153 works is three times bigger than the number of works exhibited in previous Threadneedle Exhibitions. After some criticisms of the selection last year, the selectors have apparently included a much broader cross-section of figurative painting and sculpture than that seen in any previous Threadneedle Prize exhibition. 37 of the works selected are sculptures. 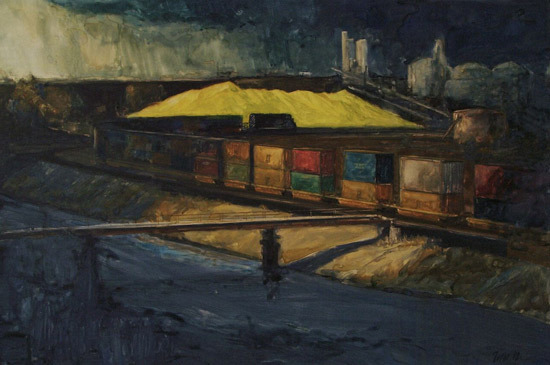 The artists included also vary from past winners of major prizes - including this prize - and prominent figurative painters among the premier art societies to recent graduates and younger emerging artists. This is also the first year that artists from Continental Europe have been able to submit work. Plus - if these trends continue - it makes the Threadneedle Prize = a much more attractive competition to enter from the artist's perspective. The Threadneedle Prize Exhibition 2012 is to be held at the Mall Galleries in central London, which is held between 26 September and 13 October 2012. I saw a lot to like - and a lot of unique and/or original contemporary figurative art as I went through finding the websites. Right click on the link in their name and open in a new tab to see them. If you spot any errors and/or want to volunteer a link to a selected artwork (or an image of it) please leave a comment or email me - see the right hand column for how to contact me. I'm also happy to publish a small number of additional images of selected work in this post - just send me the file. Posted by Making A Mark on Tuesday, August 21, 2012 4 comments Who's linking to this post? 19th August 2012 - Who's made a mark this week? I'm sitting writing this late at night on the basis I thought it might be cooler. It's not - and I might just have to finish this tomorrow. It's been three weeks since the last "who's made a mark this week" and I'm currently recovering from an excess of the Olympics and living in a weird limbo land before the Paralympics start up at the end of the month. I live two miles from the Olympic Stadium and it was very odd watching all those fireworks in the opening and closing ceremonies both through the window behind my television at the same time as I aw them on the box. I was amused by this post on the Etsy blog Noted: When Artists Competed at the Olympics. appearing at OK Harris Gallery, New York, U.S.A.
Congratulation to David Poxon RI (Art of the Real) and David J Teter (Avid Art), two regular readers of this blog who have both been elected to the National Watercolour Society. Posted by Making A Mark on Sunday, August 19, 2012 2 comments Who's linking to this post? Categories art, art blogs, Art Business and Marketing, Art Galleries and Museums, artist, artists, drawing, painting, sketching, who's made a mark this week? I'm not a fan of Hirst - I'm in the Robert Hughes camp. I was pretty sure this exhibition was going to draw huge numbers when it first opened and I really don't like viewing crowded exhibitions. However this is one of the major exhibitions being shown this year as part of the Cultural Olympiad. The exhibition is a retrospective of his work to date and one of the interesting aspects is to see how themes play out across the years - and also to realise how few themes there have been in total. I haven't bought the catalogue which was heavy on pictures and light on words so what follows is pure reaction from me - filtered by a few days to see what stuck in my mind. Posted by Making A Mark on Saturday, August 18, 2012 2 comments Who's linking to this post? Today the National Portrait Gallery in London has announced a change in its licensing arrangements for images needed for academic or non-commercial purposes. In future it will be possible to download images, which are out of copyright, for free. I've been campaigning behind the scenes for years to get the major museums to make their collections more accessible to those who want to study images and publish them for non-commercial purposes. I've written more than a few emails in my time to explain why stated licensing arrangements were a nonsense - particularly in respect of publicly funded art galleries and museums which have educational objectives! I've explained at length why the processes required for the commercial print exploitation of high resolution images are neither relevant nor appropriate for low resolution images needed for academic study or personal use. It has felt rather like hitting one's head against a brick wall at times! One of the institutions which has been open to the notion that the approach to licensing needed to change is the National Portrait Gallery in London. There has been movement over time - and I'm delighted to announce a major change which will hopefully prompt other major collections in the UK (and elsewhere) to do something similar. Today, the National Portrait Gallery announced that it now enables those who need images for academic or non-commercial purposes to download a wide range of images for free. Over 53,000 low-resolution images will now be available free of charge to non-commercial users through a standard ‘Creative Commons’ licence and over 87,000 high-resolution images will also be available free of charge for academic use through the Gallery’s own licences. This new provision only applies to those images which are out of copyright. Those which are still subject to copyright still require permission to be sought from the artist or the artist's estate. Posted by Making A Mark on Monday, August 13, 2012 0 comments Who's linking to this post? The Olympics finish this weekend as does "Picturing Britain" - the special exhibition by the Royal Watercolour Society at the Bankside Gallery. In this historic year the Royal Watercolour Society presents a celebration of all things British. Come and see how RWS artists have been inspired by the diverse events of 2012, from the Thames Jubilee Pageant to the London Olympic Games. 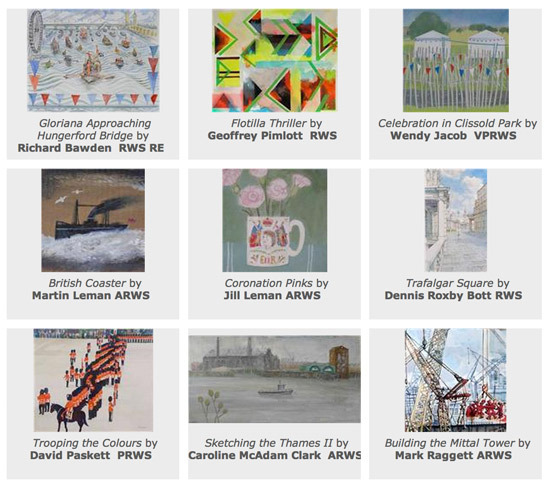 the RWS website has a slideshow of paintings in the exhibition. I don't know if the slideshow is characteristic of the paintings in the show or whether it just reflects the paintings of those who submitted digital images. I know that websites can't always convey what a painting looks like in real life - but on the basis of the slideshow, the paintings which I liked best were by Richard Bawden, Peter Quinn and Mark Raggett. I know all the Olympic sites painted by Mark from the Greenway, the paths by the rivers and Stratford and he's caught the state they were in for a long time very well indeed. 149 Days to Go, Trafalgar Square is an excellent rendition by Peter Quinn of the atmosphere in Trafalgar Square on a winter's Evening. Richard Bawden's painting of Gloriana Approaching Hungerford Bridge is one of the best of those executed to record the Jubilee Celebration. What I find really very odd about the paintings on the website is the bias towards what appears to me to be a 'faux naive' style. Why has Martin Leman suddenly decided to paint like Alfred Wallis? Very odd. To my mind, there just seems to be rather too much in a naive style and rather too few paintings by artists demonstrating skills in draughtsmanship and the ability to utilise the full range of characteristics of watercolour paint. I believe the latter is what prompts people make trips to see exhibitions at the Bankside Gallery. The problem with 'faux naieve' is that it can tend to make a commercial gallery website look no better than one which hosts the amateur art of a provincial art society - and that in my experience of viewing numerous exhibitions is then always reflected in sales. I'm hoping to see the exhibition later today and will report back with an update. I'll be paying particular attention to the range of styles, the skills demonstrated and the quantity of red spots! I'm also going to try and answer the questions 'Is this the best the RWS can do'? Posted by Making A Mark on Saturday, August 11, 2012 1 comments Who's linking to this post? What computer skills do artists need? Can you be a successful self-employed artist in today's art market without computer skills? What computer skills does an artist need? I've still not got quite got the hang of my Apple Magic Trackpad! Posted by Making A Mark on Wednesday, August 08, 2012 17 comments Who's linking to this post? The art world is really going to miss Australian art critic and "national living treasure" Robert Hughes who died yesterday in New York aged 74. I'm in no way an expert on Robert Hughes however I do like a man who knows his own mind when it comes to art and is uncompromising in stating his views - and he was certainly that. I loved all his art programmes on TV - it was art for those who don't want it "dumbed down"! He wrote extremely well and is undoubtedly one of those people who made art more accessible to many people - notably through his book The Shock of the New which must rank as one of the most seminal books on the art of the twentieth century that has ever been written. (His TV series of the same name is available as a DVD set). At the same time he was apt to criticise those he considered to be corrupting or devaluing art. In 1987 he published The Fatal Shore, his best selling account British penal colonies and the early European settlement of Australia. Posted by Making A Mark on Tuesday, August 07, 2012 5 comments Who's linking to this post? The recent Professional Development Seminar of the Society of North American Goldsmiths provides seven different presentations on different aspects of Shipping. Much of the content - principles and practical advice - is also excellent advice for all artists who ship art both domestically and internationally. If you ship art, I very much recommend you take a look. This is a presentation by Harriete Estel Berman, artist and author of the Professionhal Guidelines, ASK Harriete and co-organizer of the SNAG Professional Development Seminar. The Society of North American Goldsmiths has a specific section on its website devoted to professional development and the provision of guidance and support with respect to the art business as being a key part of its role. SNAG produces the Professional Development Seminar every year during the annual conference. The Seminar delivers three hours of concrete information that will change the way you approach your work and the way you do business. What's your best tip for shipping artwork? Do you have any online advice or guidance which you'd like to share and/or recommend? Posted by Making A Mark on Monday, August 06, 2012 2 comments Who's linking to this post? Below you will find the Award Winners. Links in the name of the individual winner below is to their website if they have one. 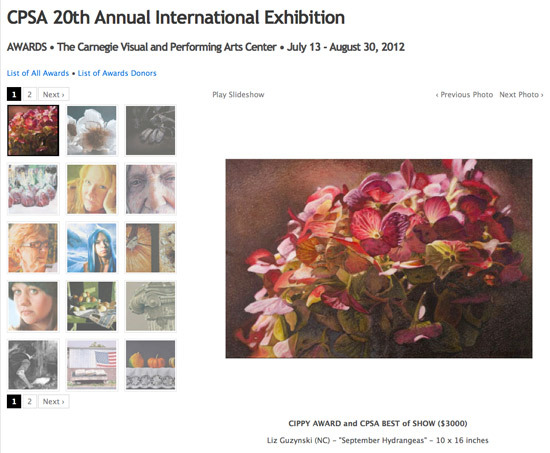 Links in the title of the piece are to the image of the artwork on the awards site. 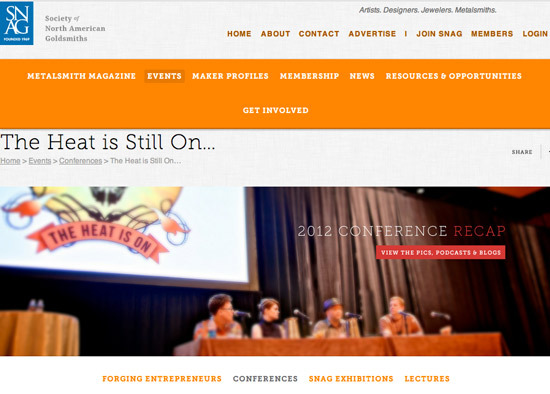 Posted by Making A Mark on Saturday, August 04, 2012 15 comments Who's linking to this post? 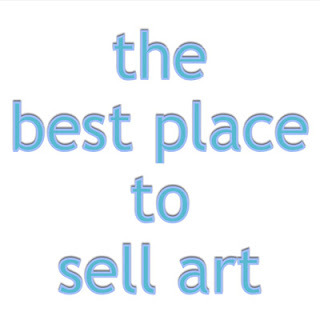 ANNUAL POLL: What's the best place to sell art in the last year? revised the categories to take account for last year's comments. I'm also getting better at tweaking the descriptions to avoid confusion. TELL YOUR FRIENDS: The more people who share and respond to the Poll the clearer the picture becomes as to what works best and what doesn't. Please tell your friends! Posted by Making A Mark on Thursday, August 02, 2012 7 comments Who's linking to this post? Poll Results: Is Facebook replacing Forums for Artists? The July Making A Mark Poll reveals that around 75% of respondents have a Facebook Account but only a third of artists actively market their art on facebook. Below you can see charts of the results for the two polls. Posted by Making A Mark on Wednesday, August 01, 2012 4 comments Who's linking to this post?